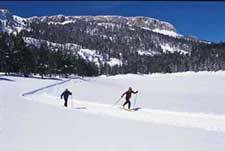 The Tamarack Cross Country Ski Center is the jewel of Mammoth Lakes, California. While Mammoth Mountain is renowned for its world-class downhill skiing, this xc ski trail system is among the best in the West. Tamarack Cross Country Ski Center, located at Twin Lakes in the Mammoth Lakes Basin, grooms 45 kilometers of track and skating lanes and provides lessons and rentals. You can also venture out on your own on the Inyo National Forest's winter trail system. The surrounding mountains, forests and meadows offer excellent ski touring and telemark terrain. There is an extensive system of trails known as the Blue Diamond trail system which mark the route for cross country skiers through tall Jeffrey pine forests and to fascinating geologic attractions like Inyo Craters, Obsidian Dome, and Hot Creek. 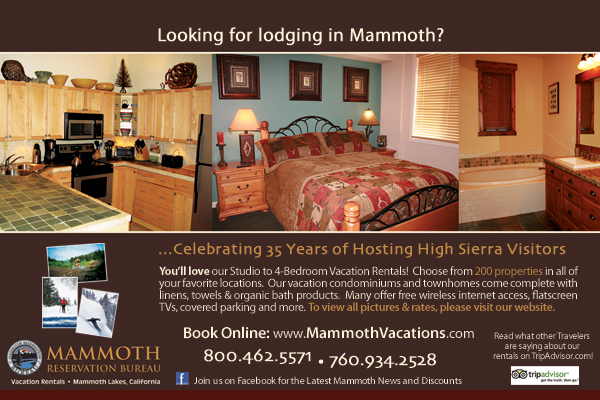 You won't have to go far to find magnificent vistas of the High Sierra. The trails are sign posted and don't cost a thing to hop on. This is a great alternative for more advanced cross country skiers and those who don't want to pay a fee to hop on a groomed trail. Trails are rated based on difficulty and terrain and even a beginner can put on some skis and be out in the forest with minimal guidance or training. Our local sporting goods stores will have all the equipment you need. The Mammoth Visitor Center and Ranger Station located at the entrance to town on State Highway 203 offers free winter trail maps and information on current trail conditions and regulations. It's a good place to start your adventure in the forest and get solid information from our local forest rangers.